In a time when very few people had flown in a plane, much less piloted one, being known as “an aviator” actually meant something. There was a certain dash, a panache, connected to the term “aviator”; it conjured thoughts of a daring, reckless character who was able to journey to mysterious, far off lands at the drop of a hat. Very few people in those days could lay claim to the appellation, and even in that rarefied company, Amelia Earhart was something special. Prior to the Second World War, women were expected to be homemakers or, if they worked outside the home, the options were essentially limited to secretary, nurse, telephone operator, or what we today would call “customer service”. But Earhart dared to be something more, a pilot who roamed the world, and became (along with Lindbergh, Post, and Rickenbacker) one of the four most famous aviators in America. Q: What do you get when you cross a dirty joke with a comic book? After I’ve read a Golden Age comic story I’ll occasionally have the nagging feeling that I missed something subtle, yet important, in the story and consequently I’ll go back to read it again. I had to read today’s tale more than twice to figure out why I had that nagging feeling. Earlier this week the United States observed the 74th anniversary of the Japanese attack on the U.S. naval and air base at Pearl Harbor, Hawaii. And, as happens each December 7th, people take to social media and Internet blogs to post pictures of the cover of December 1941’s National Comics #18, mentioning that the book depicts a German attack on Pearl Harbor. It’s one of those great “Believe It or Not” style factoids that frequently get passed around on the Internet, but there’s a problem with this one: the comic does not depict a German attack on Pearl Harbor. I don’t know whether it’s a case of people repeating as gospel something they’ve heard elsewhere or a case of modern-day readers who struggle with the highly compressed (by today’s standards) style of writing employed by 1940’s comics, but even the Golden Age website Comic Book Plus mentions the “German attack” on Pearl. The Golden Age of Comics was a very creative time; the new comic book medium had few “rules” and the writers and artists were making up the conventions as they went. The result was an odd and colorful assortment of characters, quite a few of which are still with us in comics published today. Of course, not everyone who picks up a pencil is a creative genius, and a fair bit of idea swiping occurred in the 1940’s. Occasionally while reading a period comic you’ll come across a character who seems familiar – and I’m being generous here; what I’m saying is that some character ideas were simply stolen from a competitor’s comic. BUY A FUN GAME AND SUPPORT THIS BLOG! Please click the logo, buy a cool game, and help support the Big Blog o'Fun! 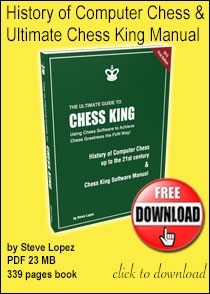 READ MY FINAL CHESS BOOK! Click the pic to download the free PDF! Check out some of my game work! ■Hideouts & Hoodlums, Supplement IV, Part II - Harvey-Timely Golden Age comic characters statted out for your OSR games! After nearly a half-century of comic fandom, I tend to view the world through four-color glasses. Here I share my various thoughts and nurglings about comics, adventure fiction, role-playing games, collectible minatures games, wargaming, TV/movies, and whatever else might spring to my restless mind. By the way, I also steadfastly and flatly refuse to grow up. Tough - deal with it. Dang! It’s all Gregorian and stuff! I own the copyright to all of my articles on this blog. If you wish to reprint/republish any content herein on your own blog, website, or anywhere else, please send me an email (click my "Meet the Proprietor" image above for the link) to ask for my permission. I will ask you to credit me and link back to this blog, and then most likely say "Go ahead." Thank you in advance. C.O.D.E. Guardian – the COOLEST thing on the Internet! Chess King – the easiest, coolest, and most FUN way to improve your chess! 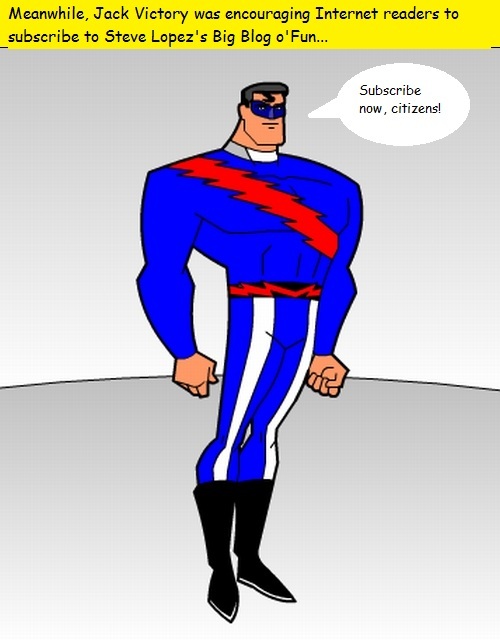 Jack Victory Wants YOU (to subscribe to the Big Blog o’Fun)! Subscribe to this blog and never miss another post -- EVER! Just type your email address in the box below and click the button to receive updates and notifications without which life just wouldn't be worth the living! Gosh, Mr. Victory - do you really mean it?!? FOLLOW THE BBo’F ON FACEBOOK!